Rob Pearce of Mardi Gras JazzBand seen here at Farnborough Jazz Club taken at Diane’s birthday party 12jan2018 by Mike Witt. 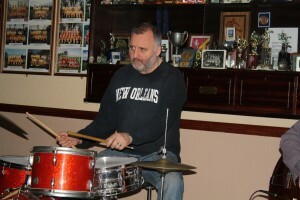 Super band leader, ROB PEARCE, who plays trombone, often visits New Orleans, so he just ‘lives’ his music. 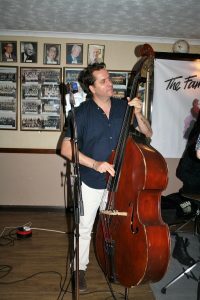 Oh, by the way, he just recently got married too (just before Keith and I) to a beautiful young lady (Liz) who often joins him here at our FARNBOROUGH JAZZ CLUB. Tonight, 27th APRIL 2018, Rob’s super band will be LEIGH HENSON on trumpet, plus JOHN ELLMER on his many reeds, JOHN STEWART on banjo & guitar, STEVE SMITH on bass and PAUL BAKER on drums. Looking forward to seeing you all tonight to dance the night away. P.S. I shall return tomorrow to update this photo. P.S. 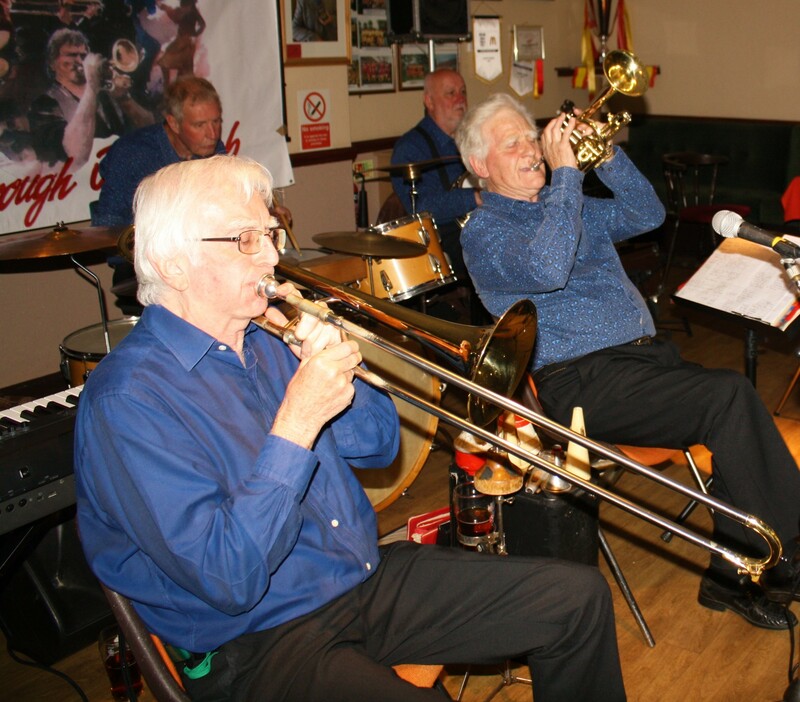 Plus Sunday’s gig too, ‘4-IN-A-BAR+1’, who play ‘Smooth Dinner Jazz’ at YE OLDE WHYTE LYON, LOCKS BOTTOM, Kent this SUNDAY, 29TH APRIL 2018, 3:00PM-6:00PM, The musicians are JOHN LEE on tenor sax, TIM HUSKISSON on piano, ROGER CURPHEY (double bass), with KEITH GRANT (drums) and me (DIANE), singing a few songs. (Always the last Sunday of each month). Treat yourself and book a roast lunch (Tel: 01689-852631) served between 12:00 & 5:00pm. Last time everyone loved the music, with many enjoying the newish chef’s Sunday roast. This delightful Shepherd Neame pub (dated 1626) is situated in Locks Bottom, BR6 8NE, next door to Sainsbury’s & PRU Hospital. Sainsbury’ parking has changed on Sundays £2 ‘til 4:00pm (refundable for goods Sainsbury’s) with a walk-thru to pub at far right corner (face Sainsbury’s). Oh yes, also please read previous input about info re heart attacks if you are on your own and what you can do. This entry was posted in Mardi Gras JazzBand on April 27, 2018 by Diane. Hi everyone, Steve Moyse sent this information to me (he had received from his son). Please copy it and send on to all your family and friends – as it is really important for everyone to know! Let’s say it’s 7:25pm and you’re going home (alone of course) after an unusually hard day at work. You’re really tired, upset and frustrated. Suddenly you start experiencing severe pains in your chest that starts to drag out into your arm and up in to your jaw. You are about five miles from the nearest hospital. Unfortunately you don’t know if you’ll be able to make it that far. You have been trained in CPR, but the guy that taught the course did not tell you how to perform it on yourself. THIS WILL HELP SURVIVE A HEART ATTACK WHEN ALONE? Many people are alone when they suffer a heart attack. You are experiencing your heart beating irregularly and you begin to feel faint. You probably only have about 10 seconds left before losing consciousness. However, you can help yourself by coughing repeatedly and very vigorously. A deep breath should be taken before each cough and the cough must be deep and prolonged, just as you would when producing sputum from deep inside the chest. A breath and a cough must be repeated about every two seconds without let-up until help arrives, or until the heart is felt to be beating normally again. Deep breaths get oxygen into the lungs and coughing movements squeeze the heart and keep the blood circulating. The squeezing pressure on the heart also helps it to regain a normal rhythm. In this way, heart attack victims can get help or to a hospital. Tell as many other people as possible about this. It could save their lives! A cardiologist says, if everyone who gets this message and kindly sends it to 10 people, you can bet that we’ll save at least one life. Rather than sending jokes, please …… contribute by forwarding this as an email, it can save a person’s life…. If this message comes around to you ……more than once…..please don’t get irritated….. you need to be happy that you have many friends who care about you and you are being reminded of how to tackle….Heart attacks…. when you are alone. I hope you never have to go through this yourself. This entry was posted in Uncategorized on April 26, 2018 by Diane. 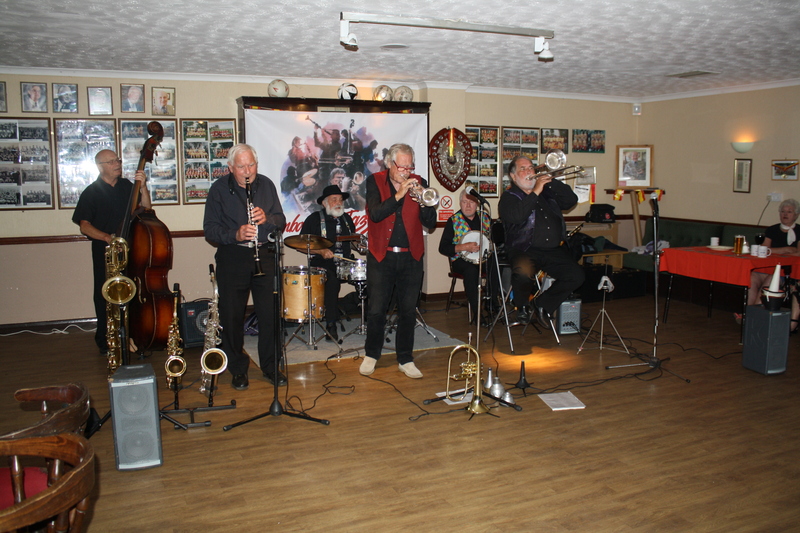 Mahogany Hall Stompers at Farnborough Jazz Club (Kent) on 20th May 2015. 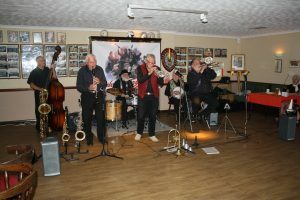 (LtoR) Colin Graham (trombone), Chris Marchant (drums), Brian Gyles (band leader & trumpeter), ‘Southend Bob’ Albutt (banjo).). Photo by Mike Witt. 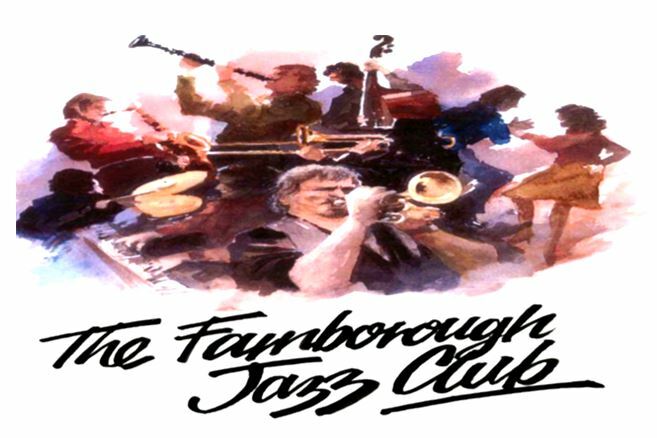 Mahogany Hall Stompers at Farnborough Jazz Club on 13th March 2015. 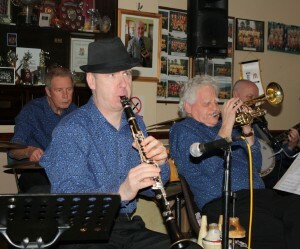 (LtoR) Chris Walker (drums), Tim Huskisson (clarinet), Brian Giles (trumpet) & ‘Southend Bob’ Allbut (banjo). Photo by Mike Witt. 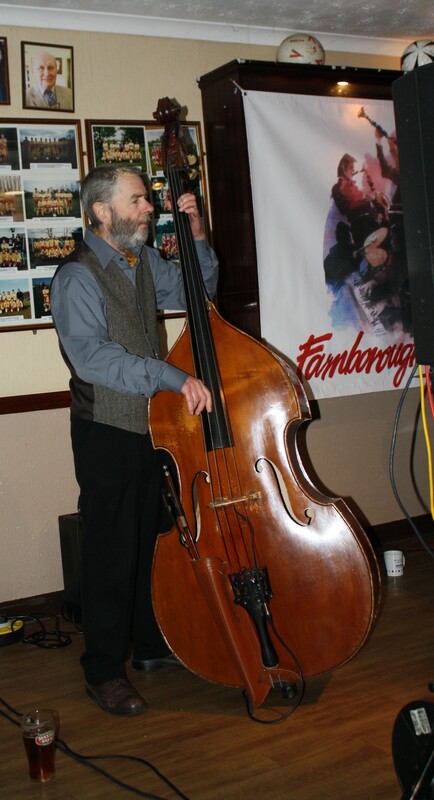 Roger Curphey (Baht-at) on double bass here with his pint. With Mahogany Hall Stompers at Farnborough Jazz Club (Kent) on 5th February 2016. Photo by Mike Witt. Following this lovely warm weather, I expect you have been gardening and will want a nice pint from our Shepherd Neame bar to reward yourselves. Our large car park is free, so no reason to stay at home. This entry was posted in Mahogany Hall Stompers on April 19, 2018 by Diane. 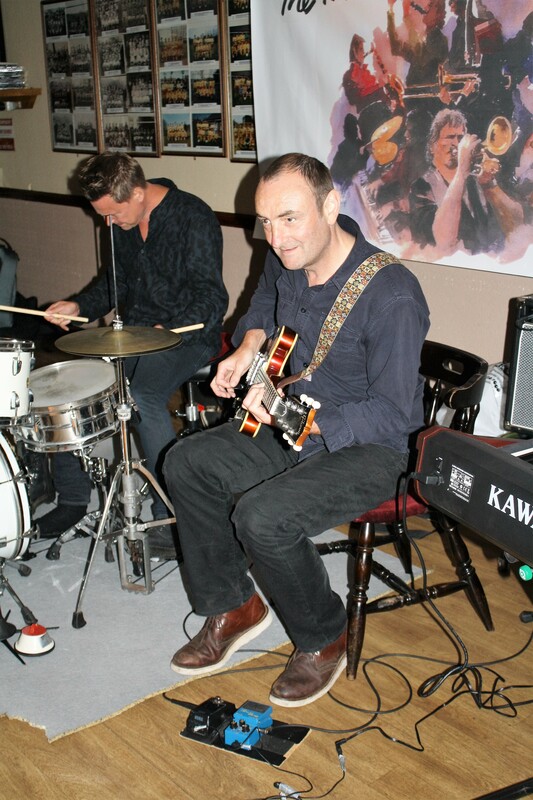 JOHN ‘flashback radio’ RUSCOE on guitar plays with Martyn Brothers Jazz Band on 30th June 2017 at Farnborough Jazz Club. Photo by Mike Witt. Martyn Brothers at Farnborough Jazz Club, Kent on 15th January 2016. 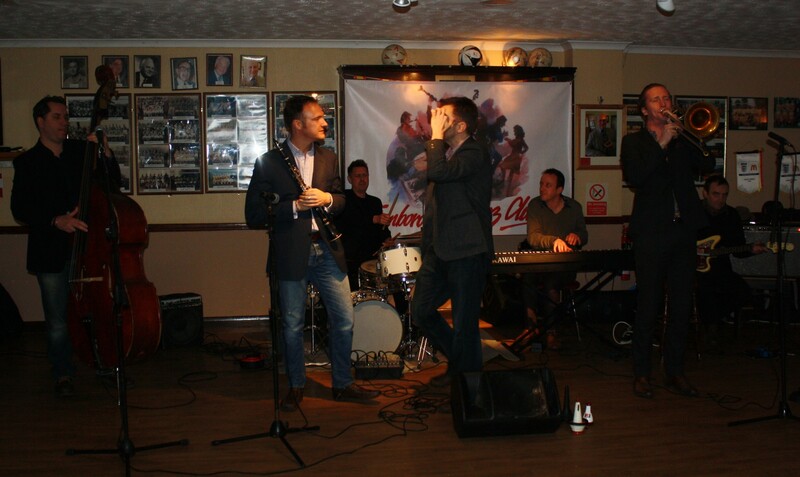 (LtoR) Ben Martyn on double bass, Richie Howard on clarinet, Dom Coles on drums, Allen Beechey on cornet, Ian Beetlestone on piano, George Simmonds on trombone and John ‘flashback radio’ Ruscoe on guitar. Photo by Mike Witt. Ben Martyn with his Martyn Brothers Jazz Band at Farnborough Jazz Club Friday 30th July 2017. Photo by Mike Witt. The young and talented MARTYN BROTHERS JAZZ BAND are here again at our FARNBOROUGH JAZZ CLUB on Friday, 30th April 2018. Dynamic brothers, BEN MARTYN (double bass&vocals) and EMILE MARTYN (drums), are joined by ALLEN BEECHEY (cornet), RICHIE HOWARD (clarinet), DEAN ROSS (piano) and not forgetting of course, JOHN ‘flashback radio’ RUSCOE (guitar). I believe this is the first time we have had Dean play for us here, so dont forget to give him our big warm Farnborough welcome please. Regulars and newcomers alike are welcome. The music is from 8:00pm till 11:00pm and we love to dance here. Of course, we enjoy a Shepherd Neame bar and have plenty of parking. By the way, just a reminder, these brothers are the sons of famous drummer and band leader Barry Martyn, so jazz is in their blood, well they spent their childhood in New Orleans and played with many great names out there. They often visit their Dad, who now lives in New Orleans. 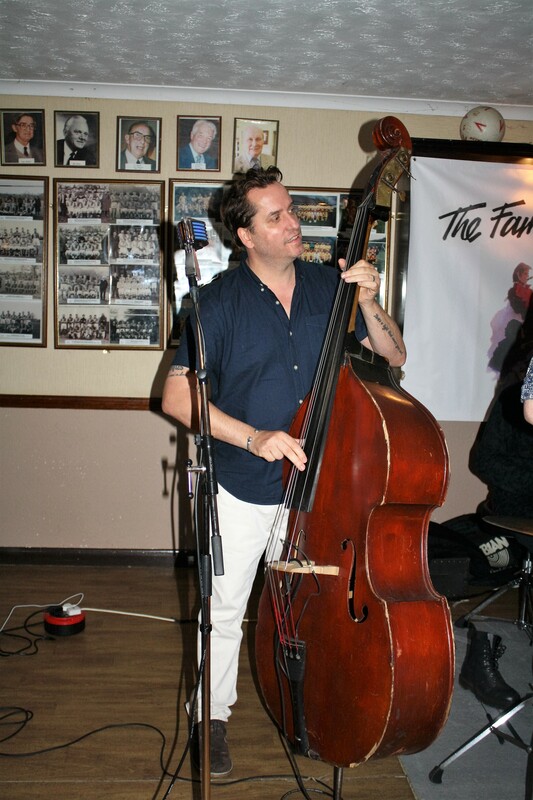 Ben Martyn, (d.bass) of Martyn Brothers Jazz Band at Farnborough Jazz Club, Kent on 3rd April 2015. Photo by Mike Witt. 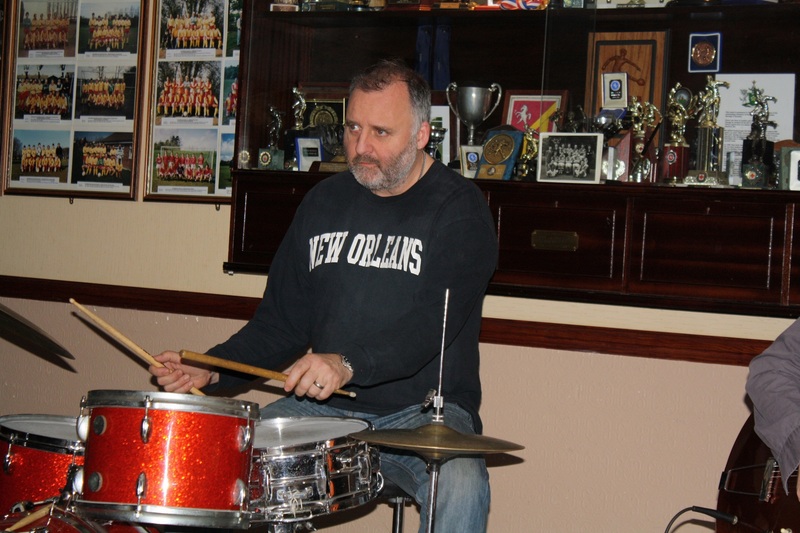 This entry was posted in Martyn Brothers Jazz Band on April 13, 2018 by Diane. 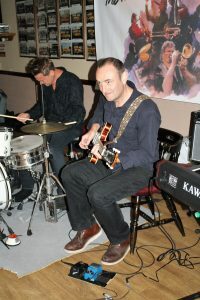 Dave Rance’s Rockin’ Chair Band, 10th June 2016. Photo by Mike Witt. 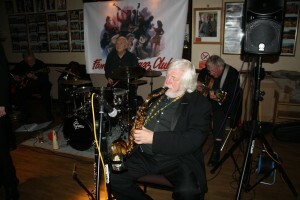 DAVE RANCE’S ROCKIN’ CHAIR BAND is our band booked for tonight at FARNBOROUGH JAZZ CLUB. That being Friday, 6th April 2018, from 8:00pm till 11:00pm. Band leader, DAVE RANCE (trumpet & vocals) has booked JOHN AUST (clarinet), GORDON RUSHTON (trombonist), with COLIN FREE (double bass), DOUG PARRY (banjo & guitar) and HENRY HARRISON (drums). They fare from Leighton Buzzard and have travelled here a few times over the years. Their last time was in February 2017, so it would be nice of you all to give them a big welcome back. We have a lovely atmosphere here, so anyone new will always feel at home. Of course, we have plenty of parking space and a (club prices) Shepherd Neame bar to help. P.S. You may remember last time they were with us, they had DEREK SCOFIELD. He had a cataract operation a week, or so ago, so not here tonight, We are wishing him well soon, but please, a warm welcome to JOHN AUST. 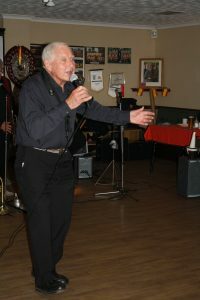 Colin played alto, tenor and bass saxes plus piccolo & vocals, and memorably, you may recall, did a little bit of tap dancing too – here is a photo of him. I will eventually upload the rest in due course. Also, you will notice GRAHAM WISEMAN was playing trombone with the band in 2016. Graham played here often. Remembering him tonight – although a warm welcome to GORDON RUSHTON too. This entry was posted in Dave Rance's Rockin' Chair Band on April 6, 2018 by Diane.